A friend gave me a bunch of fabric from her mom's stash. 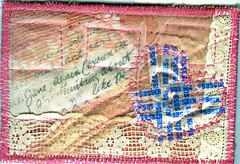 I used the lace and pinks for this fabric postcard. The writing is Ralph's, done with a transfer technique. I especially like the part where I had to eat all those chocolate kisses to create the heart...I wrote on the back "Hope Valentines Day covers you in kisses!" 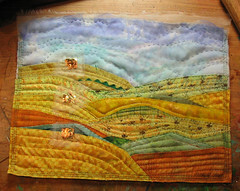 It was a rainy day and a perfect day to stay inside and putter in the studio. 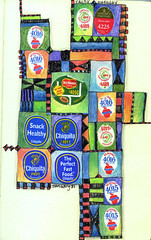 And here's another silly fruitsticker color pencil quilt done in my sketchbook moleskine. 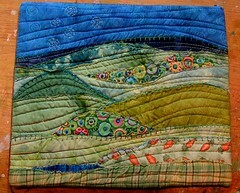 The 3rd of my little landscape quilts. It's about 8.5x11"
Can you guess why it's called Rabbit Lake? Husb brought me the first camelia of the season, our friend installed a new hot water hookup in the laundry room and the chant (my first chant!) from last saturday's yoga workshop. 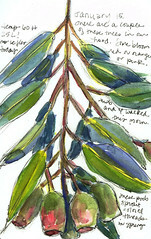 watercolor moleskine. hand carved stamp. 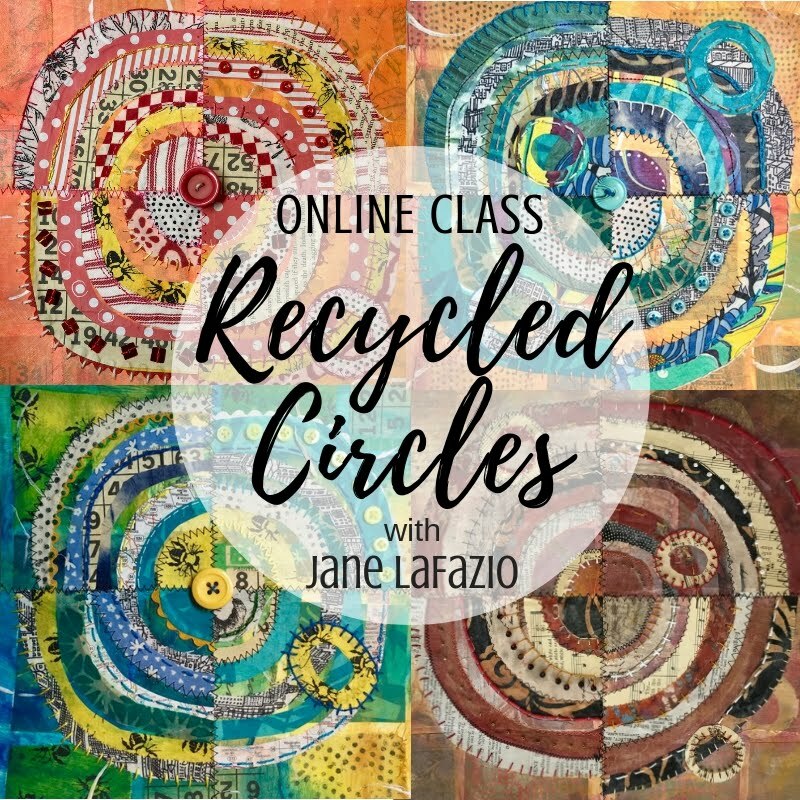 That Janey on the East Coast! You know the photo of Buddy in the sink I just posted? 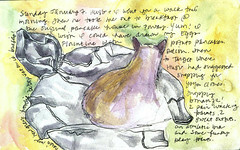 Well Janey has already drawn him and blogged him! Thank you Janey! Another wonderful drawing. I've 'met' some wonderful people through my blog and flickr. 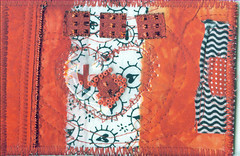 I admired the creativity of Ruth Rae and she sent me this wonderful felt, lace and yarn valentine, and we've never even met. Isn't that amazing? You can see the real thing here, on her site. 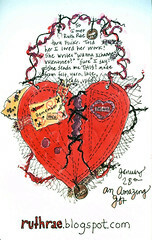 I promised I'd sent her one of my fabric postcard valentines...which, compared to her glorious work, look rather meager. THANK YOU Ruth!! 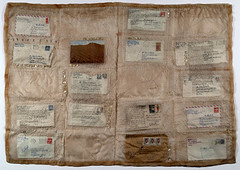 This piece (a companion to the cleverly named "Ralph's Letters") just got accepted into an international exhibition! The 49th Annual International Exhibition at the San Diego Art Institute in Balboa Park. And to give you an idea how thrilled I am --A total of 1518 entries from 21 countries were submitted and 84 selected works of art were selected! The exhibition runs April 29 through June 10 and the gala reception is April 28th, 6-9pm. This is a first for Buddy! I walked into the bathroom, flipped on the light, and there he was...too cute. 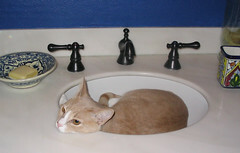 There's even a Flickr group called 'cats in sinks' which I just joined! 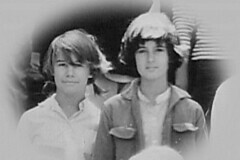 That's me on the right...at camp..I think I was about nine. And that's Karen on left. She contacted me after reading the interview of me in Jan/Feb Cloth Paper Scissors magazine. Sent me this photo and an email and is reminding me of crazy, dusty, childhood memories! Karen and I were best buds, and I think we met in Kindergarten. I haven't heard from her in...gulp...40 years? I have a collection of small pitchers. This one was my grandma's. One of the very few things I have of hers. I was going to draw all of my pitchers, but I think I was too worn out. 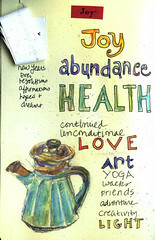 (Yoga class this morning, then I gave blood, then I had my first neuromuscular massage. whew!) Oh, and the beads are from Africa, a gift from my friend Beth--I can't wait to do something fun with them. I went to poetry reading this afternoon at NTC at the Expressive Arts Institute. Diane Gage, Elizabeth McKim and Megan Webster read their poems about memory and relationshop. It was divine! Such a delightful way to spend an afternoon. Resolution: I want to memorize a poem. watercolor moleskine. I feel I was brave to draw the buildings and try to use perspective! Phew! This took about an hour & 1/2--longer than I wanted to spend on this. As you can see there is tons of stuff in my kitchen window, and I didn't even draw all of it. Tomorrow I think I'll choose a less intricate subject matter! I do love this view in my house, the garden window is filled with plants and favorite objects. 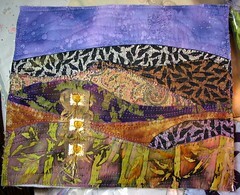 Here's another example of the landscape lesson I'm teaching in my Art Quilt classes. I layed this out and created it in class, then sewed it at home. I woke up this morning and decided I wanted to make a sock rabbit. So I spent waaay too long on the internet looking for patterns. Why, you ask? Some deep-seeded childhood trauma perhaps? The angst of never having a sock monkey of my own? Who knows. 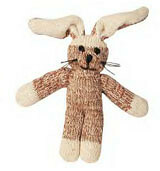 I found a pattern for a bunny and another bunny and for the traditional sock monkey on line, so that's a start. Though I didn't find instructions for this particular rabbit. Also, I've tried to knit and I'm really bad at it, but I would like to learn to knit socks. There, I said it. Lunch with Pamela at the Contemporary Museum of Art La Jolla cafe. Itwas a cold day, but beautifully clear. I didn't appreciate the waaaay modern art in the museum so I went outside to the sculpture garden. 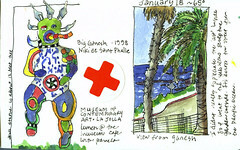 The Niki de Saint de Phalle sculpture of the 'Big Ganesh" stands 11 feet tall in the garden and the view of the Pacific ocean (across the street) is breathtaking. There are a couple of these trees in our neighborhood. Each fall, (i think) they burst with color from their pods. One tree has orange 'silk' another bursts red. This is a very loose (2 glasses-of-wine-loose) drawing painting. 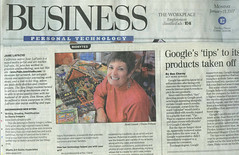 I'm on the front page, of the Business Section, of today's San Diego Union Tribune. Read the article here. I mention Danny Gregory's website in the article...he inspires such loyalty, doesn't he? YUM. 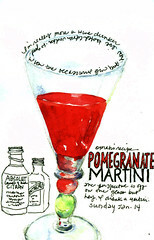 I tried Oprah's recipe for a pomegranate martini and it is sooooooooo good. From my collection of Mexican molinillo [moh-lee-NEE-yoh] hot chocolate stirrers. I have about 10, purchased in various cities in Mexico. It would be a good day for hot chocolate--It's so cold, I saw icicles on my walk this morning! "to live content with small means; to seek elegance rather than luxury, and refinement rather than fashion; to be worthy, not respectable, and wealthy, not rich; to listen to stars and birds, babes and sages, with open heart; to study hard, to think quietly, act frankly, talk gently, await occasions, hurry never; in a word, to let the spiritual, unbidden and unconscious, grow up through the common — this is my symphony. " I picked these rosehips on my walk today. I also helped a lost dog named Shilo, saw a hawk on a distant tree and heard a woodpecker. Quite the eventful 2.5 miles! I seem to enjoy doing these little fruitsticker-like quilts. This one turned out very Rube Goldberg-esqe. Done with color pencil (prismacolor) while watching TV. Sweet smelling paperwhites that we grew from bulbs in our kitchen window, a bit of lace ribbon leftover from making valentines, and a ticket stub from a wonderful concert we attended last night. In the small hall in LaJolla, the orchestra, the singers, the music Aaron Copland created to accompany Emily Dickinson's poetry was just magical. Kurt Weill's music put to Walt Whitman's heartbreaking poems of lost soldiers was especially touching. Husb and I enjoyed it all very much. 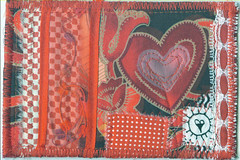 Fabric Valentine postcards. I've always loved hearts, so Valentine Day is my favorite holiday. 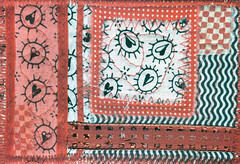 These are 4x6" and they don't show up very well in the scans. 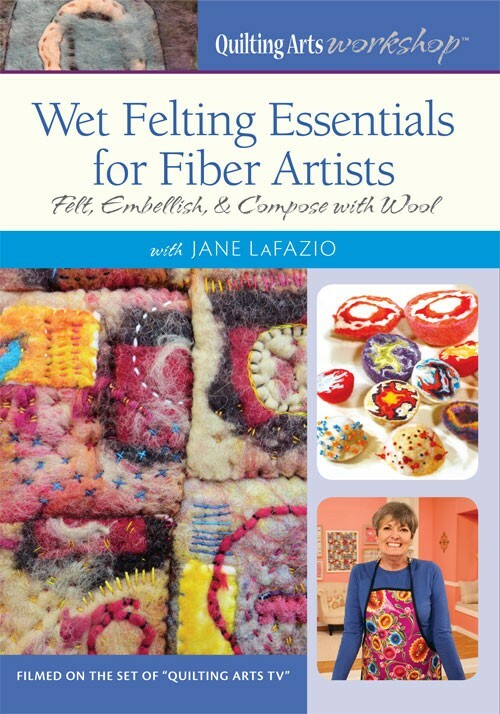 They have ribbon, and red organza, and clear vinyl and some hand-dyed fabric and beads. They were lots of fun to make, and I want to make more. Oh, by the way, if you haven't already heard of Keri Smith, you must. Check out her blog. 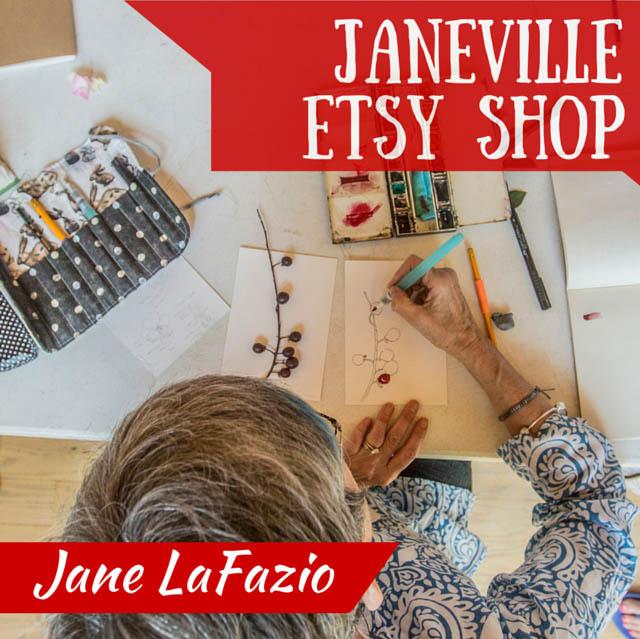 She is a brilliant and thoughtful writer and a whimsical and talented artist. Not to mention, sensitive and inspirational. I'm working my way through her archives now. A lovely Sunday spent with husb. A walk, out to breakfast, then to Target to shop for yoga clothes. 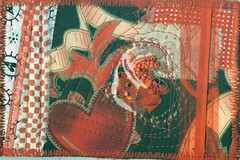 When I got home, I began working on fabric postcard valentines. Waay fun. On the sofa in the evening, I drew this; my new hoodie, purchased today. Of course, BeBop sat on it half way through, then he got up before I finished. 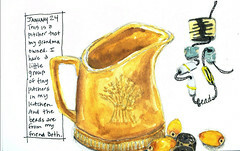 This is clearly, not one of my best drawings, but as I recently reminded, my mentor, Danny Gregory on his blog, that EveryDay Matters, and it's about the process of chronicling your days visionally in your sketchbook, and not about the finished product. Berries from my walk today. 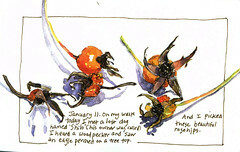 I painted a series of berries once. Love em. Goofed on the date. It is Thursday, but the 4th, not 3. oh well. Yes, it's that same pomegranate, and it's really drying out. Still a great subject to paint. Also a little pot of succulents, that is my new favorite home accessory. 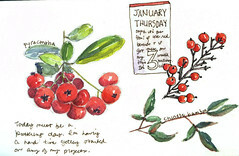 I just went from pencil to watercolor this time, not ink (except where I forgot, on the pomegranate.) It gives the sketch a softer look. Plus I tried to be really loose with the watercolor, like my new idol, Laurelines. 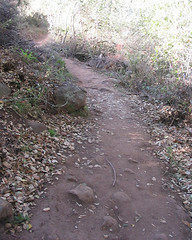 Husb and I took a walk this morning, around Lake Poway. It's a state park within a few miles of our house. It's about 3 miles around the lake and it's one of our favorite walks--especially watching the season change. Today I was motivated to bring my camera along and capture bits of what we saw. Just elements of my day. Buddy sleeping, spent firecrackers, a rose from our garden and a chocolate truffle that I promptly ate. Not the most unusual new year's resolutions, but good ones nonetheless. These last few days I've been thinking of what my goals might be for the coming year. 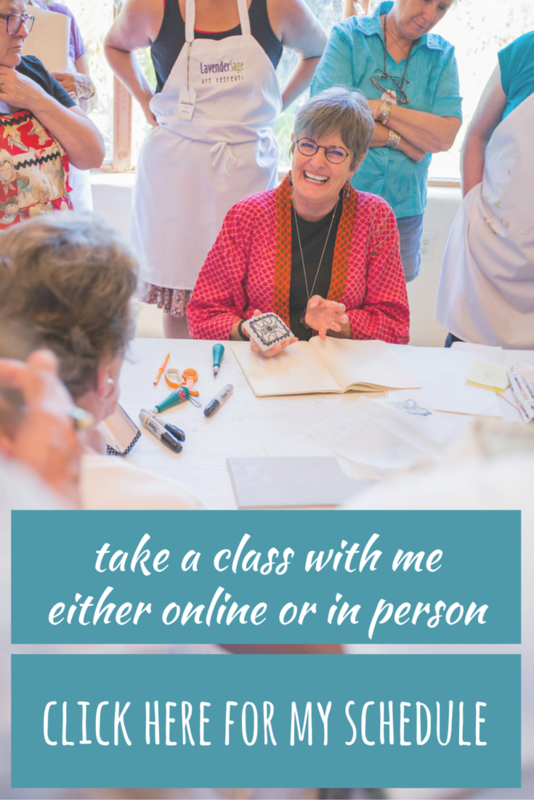 I've gone from doing 4-6 art fairs, and selling my work, to a lot more teaching the past 2 years. That seems to be okay, because the teaching gig is a more predictable income (not to mention I really enjoy it and the students seem to like me back) and I believe art sales (or at least mine) have really suffered in the last few years. 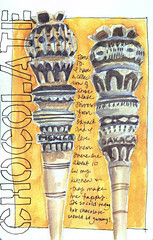 I've got the wonderful article in the Jan/Feb 07 issue Cloth Paper Scissors magazine and another article on my sketchbooks in that same magazine slated from March/April. I love the exposure and attention seeing my work published and it feeds me emotionally if not mortgagely. 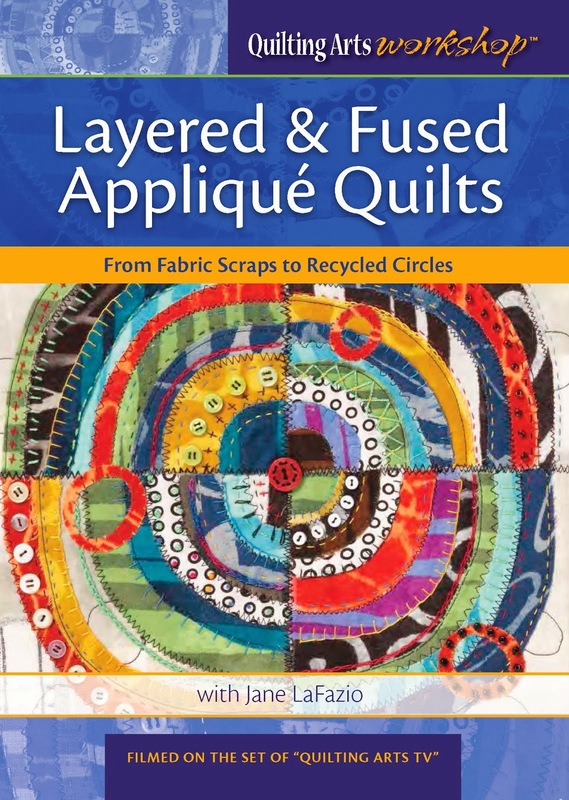 My DVD of 3 Art Quilt Techniques comes out early 2007, and I'm trying to decide what it is I want from that. 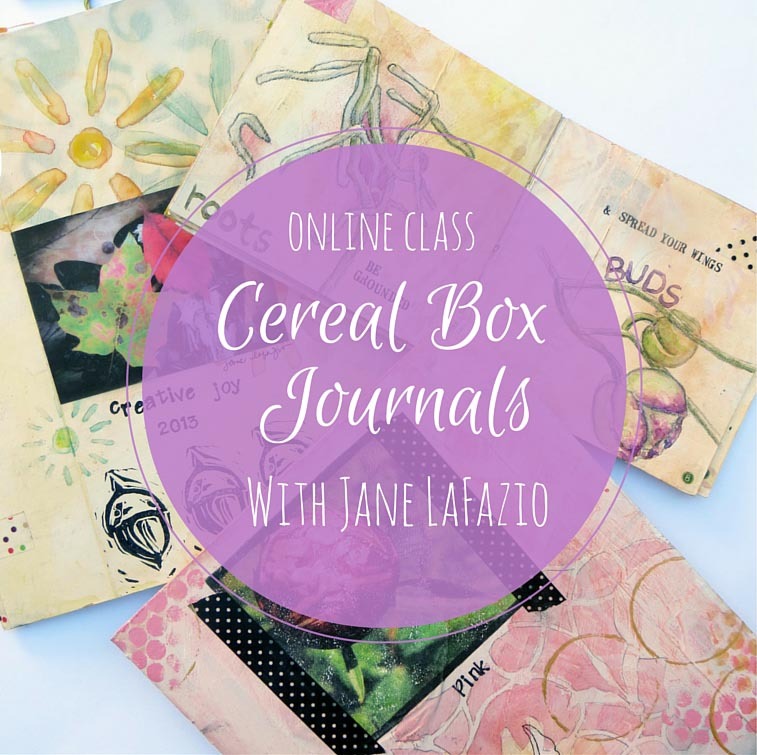 Currently I'm thinking I'd love a weekly or monthly TV segment where I'd teach or inspire a creative project. Sydicated, of course! (gotta dream big.) I'm not much of a goal setter, but I'm thinking this year, that I should be able to at least answer if someone asks me what I want out of my artist life. 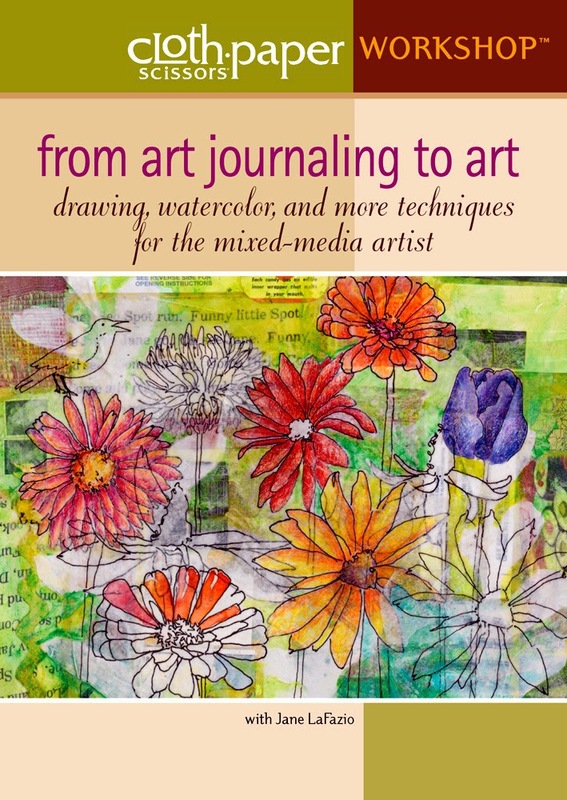 I do know, it includes continuing to draw and paint in my sketchbooks! 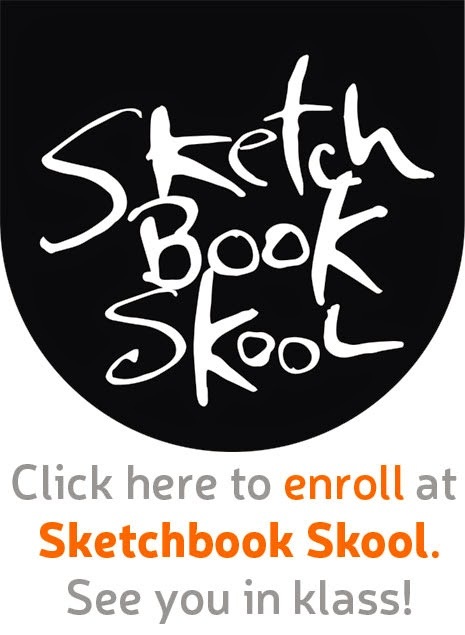 sketchbook moleskine with watersoulable crayons.